Second tier tuners which are perfect for beginners, tweakers or those who don't live very close to a broadcast site. Manufactured in China, but extremely robust, maintaining the build quality Alpine Electronics is renowned for. Max Tune series incorporates a conventional IF section of 3 x 180 kHz ceramic filters. Although modifications are unnecessary, these are relatively easy to modify once you pry the soft aluminium case of the tuner module open. Wideband, high fidelity AM Mono reception. Cannot force FM mono reception on weak noisy signals. Unsuitable for FM DX use without modification to the 2 wide ceramic filters. Easy access to filters. The best board layout I have come across in a tuner. 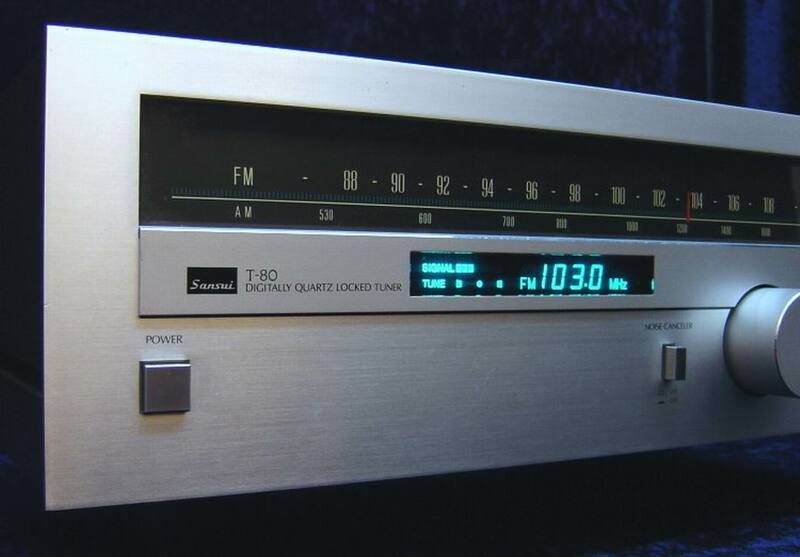 Analogue tuner with a digital frequency display. Rotary tuning dial. Wonderful sound. Unsuitable for FM DX use without a simple modification to the 2 wide ceramic filters. These specifications relate to their unmodified FM section performance. Measurements have been sourced from service manuals. All tuners appearing on this page, except the Alpine TDM-7546E have been modified slightly (all the original FM IF filters have been replaced with narrower 50, 80 & 110 kHz ones). These filter modifications may improve or degrade individual values. The Sansui T-80 was modified with an inexpensive Bill Ammons' Filter Adder board. These boards double the available conventional IF filters available in your tuner if you want to DIY. See the FM Tuner Information Centre for purchase details for these boards, which are still available in 2010. Even though they are designed for "in car use", the car tuners are used inside the house with 12v DC power using Jaycar regulated power supplies.